Tom George at Tom George Yacht Group sends news of a further $209,000 price reduction on the 25.6m motor yacht Carolina Dreamin. This Sunseeker 84 flybridge was built in 2000 and can accommodate 8 guests in four cabins, including a full beam master suite with its own private access. She also has accommodation for two crew and was recently fitted with a new Besenzoni hydraulic teak swim platform. She cruises at 24 knots and has a top speed of 27 knots. 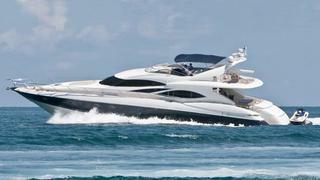 On display at the upcoming Tampa Boat Show, Carolina Dreamin is down from $1,599,000 to $1,390,000.